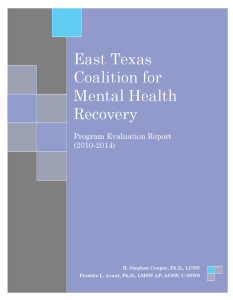 The East Texas Coalition for Mental Health Recovery (ETCMHR) brought together 12 mental health organizations to develop a network of consumers, peer specialists, providers and advocates trained in recovery and wellness. The activities of the ETCMHR were coordinated by the East Texas Behavioral Health Network (ETBHN) and funded by the Hogg Foundation. The evaluation, jointly funded by the foundation and ETBHN, was conducted by Drs. Stephen Cooper and Freddie Avant of Stephen F. Austin University. The evaluators worked closely with Stephany Bryan, program officer and consumer and family liaison, Dr. Michele Guzmán, former assistant director of research and evaluation, Kendal Tolle, program evaluation fellow, and Margo Johnson, program design and evaluation graduate research assistant. Focus groups, interviews and surveys were utilized to gather information from consumers and mental health providers who are part of the coalition. Evaluation goals included capturing the recovery experiences of the consumers providing peer-to-peer services who participated in the first year ETCMHR trainings, as well as assessing the development of the coalition itself. Download an executive summary of the evaluation report here and the full evaluation report here.